When you have a severe tooth pain or other dental emergency, the feeling can be unbearable. You want immediate emergency dentistry attention not only for tooth pain relief but for the sake of your smile. The sooner you make it to Ritchie Dental Group in the Marble Falls and Brady, TX area the more successfully we can treat your dental emergency. Ritchie Dental Group offers emergency dentistry, promptly serving you with same-day treatment when it’s needed most. If you experience a dental emergency outside of office hours, you can contact our office near Horseshoe Bay, and you’ll be directed on what to do next. Disease and fracture can also cause tooth pain, and these problems will require definite professional dental emergency attention. If you’re suffering with tooth pain coupled with any kind of swelling, visit our Burnet dentist office as soon as possible for emergency dentistry. This can be a sign of an infection that requires immediate care. Lost crown or dental filling: If you have broken or damaged a crown, filling, or other dental restoration, try to attach it the broken piece back to the tooth to avoid injuring the soft tissues in your mouth on the newly rough or jagged area. You can try to use toothpaste or a denture cream as a temporary solution, but call your emergency dentist in Marble Falls right away for an urgent appointment. Fixing the problem promptly will help to avoid more significant damage or further decay. Dental abscess: This is the result of a severe infection and must be treated immediately. In the worst cases, the infection could spread to the brain and lead to premature death. Call your dentist right away if you experience an extreme toothache that disrupts your day. In some cases, the tooth can be treated with root canal (endodontic) therapy, but other times it will need to be extracted. Either way, professional treatment is required to get you out of pain and protect your overall health. Broken tooth: Collect the broken piece(s) and store any larger ones for possible reattachment. A broken tooth is likely to cause pain and swelling, so place an ice pack to the affected cheek and feel free to take an over the counter pain medication until you can reach your dentist’s office for professional treatment. Jaw pain: Pain in the jaw can be caused by a number of issues, from an infected tooth to erupted wisdom teeth or a problem with your temporomandibular joint (TMJ). The first two will usually need immediate treatment, while TMJ issues can be treated over time. Visit your dentist to find out the cause of your jaw pain and how to find prompt relief. Knocked out tooth: Act fast in the event of a knocked out tooth! Seeing your dentist with the intact tooth within a two-hour window will help to increase the chances of successful reattachment. Right after it happens, collect the tooth and store it either in the now-empty socket or in a cup of milk or filtered (non-tap) water. Stop the bleeding with a clean gauze or cloth and call your dentist right away. Bitten lip or tongue: If you bite your lip or tongue forcefully, keep an eye on the area. Place an ice pack on it in 10 to 15-minute intervals and apply consistent pressure with gauze to stop the bleeding. If swelling, pain, or bleeding do not subside after a while, contact your emergency dentist in Brady for advice or treatment. In the case of a bitten lip or tongue, the best thing to do is clean the area and visit the emergency room if you experience complications like unstoppable bleeding. However, Ritchie Dental Group can help you with the rest of the dental emergency situations at our Marble Falls or Brady dental office. If you’ve lost a dental restoration, such as a dental crown or filling, try to save the pieces of the restoration if you can and bring them with you to your emergency dentistry visit. If you lose a tooth, bring that with you as well, either in a glass of water or milk or wrapped in a damp paper towel. Be careful not to wash away tissue that’s stuck to the tooth. We can attempt to place your knocked-out tooth back into your smile. If you experience tooth pain from a broken or chipped tooth, be sure to schedule an appointment at our Horseshoe Bay office so we can help. Whatever you do, don’t wait. 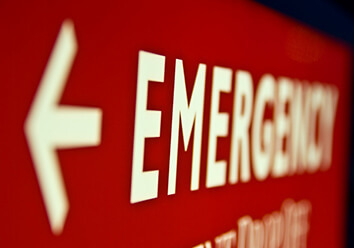 If you’re in the middle of a dental emergency, contact our office immediately. Make sure you have the number of our office handy, too, in case of any tooth pain or emergency dentistry needs in the future.